I just received this jacket a few days ago and it is awesome to say the least. I've wanted this jacket since first seeing Escape from New York years ago. Leather jackets have always been apart of my life since I was a young kid. I have a small collection of jackets and tend to get a new one every 4-5 years or so. I bought this jacket as a treat to myself for accomplishing some personal goals. I have never had anything custom made before, nor have I ever bought clothing online for fear of it not fitting, let alone buying a piece of clothing that was $750. While the price seems extraordinarily expensive, the old attage "you get what you pay for" rings true. The jacket is some of the best craftsmanship I've seen. The stitching is perfect, the measurements are perfect, the look I was going for is perfect and even the smell of the fresh leather is perfect. 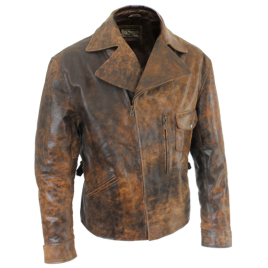 The antique cowhide has the perfect texture to it if you're looking for the harder type of leather as opposed to the soft and flimsy goatskin or lambskin. It's also not so thick where you could only wear it in the winter months. I just wore mine yesterday and it was 70F out. The customer service was also top-notch, responding to the many questions I had throughout the process. Magnoli's Escape jacket was well worth the wait, the money and is something that will last a lifetime. 10/10.